Each week of Advent, we will be sending brief messages inviting you to reflect on the week's message by offering ways to welcome and serve Christ today, in whatever identity he may come in. This past Sunday, we heard a message on the Christ Child's identity as a migrant, making the journey from Heaven to Earth in order to live as Emmanuel, God with us. — As John tells it, "the Word became flesh and lived among us." But, John says, "his own people did not accept him." Just as in Jesus's time, the world is not all that welcoming to migrants. Even so, through our work with C4WS Homeless Project, we—as a church—are able to welcome migrants from across the United Kingdom, Europe and the wider world who have come to London seeking work, a safe place to lie their head and better opportunities for their family. This week, I encourage you to read on to find out more about the work of C4WS and our cold weather shelter. 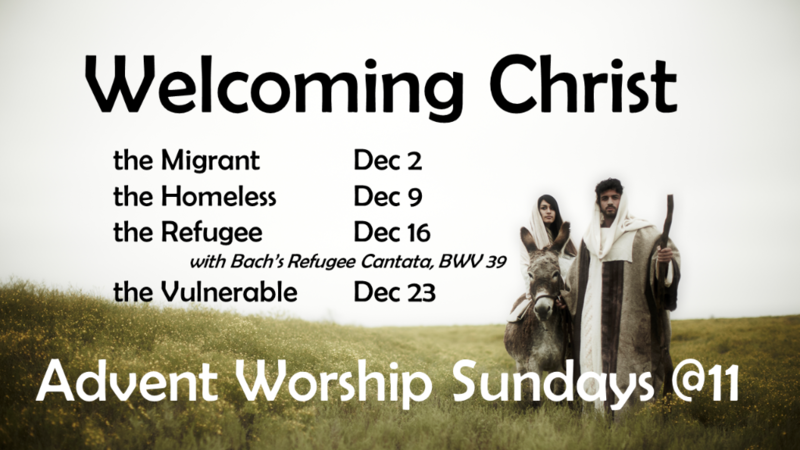 And as we prepare to welcome Christ the Migrant this December and make space to welcome the migrant's of today in our own church building, may you be inspired for the season ahead and moved to serve God with us in new and expanding ways. 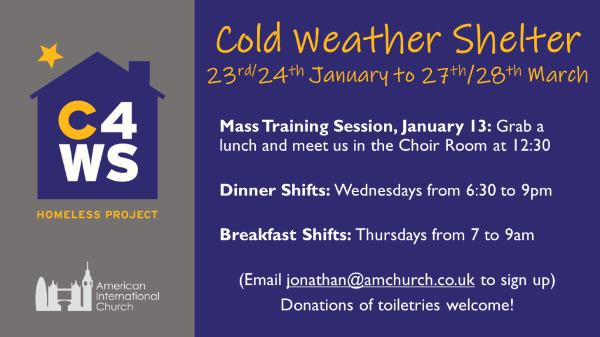 A project of CARIS Camden, AIC has been supporting C4WS (Community of Camden Churches Cold Weather Shelter) since 2009. As a part of this partnership, AIC hosts 16 overnight guests every Wednesday for ten weeks between January and March. With a devoted group of volunteers, we provide dinner, a place to sleep and a hot breakfast along with offering a warm and welcoming space for all those who pass through our doors from C4WS. In addition to the winter shelter, we support C4WS’ work with over 300 homeless people, refugees and asylum seekers each year through their mentoring scheme, English classes, Friday and Sunday Clubs and Jobs Club. 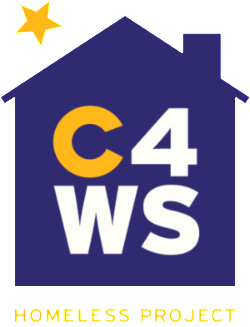 To find out more about the year-round work of C4WS, visit c4wshomelessproject.org. Able to wash a load or two of sheets? This season, we will be trialling washing all of our laundry (up to 18 duvet covers, pillow cases and flat sheets plus a few towels) in-house. This would save us over £400 that would enable us to offer other services or support other projects with new mission partners. Bags of four to five sets of bedding will be available to take home each Sunday with a week’s turn-around. Whether you wash them yourself or bring them to a cleaner—We promise not to ask!—this should be a great new way to get involved! Home from Home: There has been a major increase in guests with No Recourse to Public Funds. One of the consequences of this is that it is much more difficult to resolve housing needs during the shelter period. Last year, to meet this need, C4WS launched their own hosting scheme. This has equated to 251 nights of additional shelter to guests on top of other external hosting partnerships that C4WS has already developed. Mayor of Camden’s Charity Appeal: Cllr Richard Cotton chose homelessness as the theme of his mayoral year and C4WS as his designated charity, raising just under £45,000 through various events and special appeals. New Venues: St John’s Hampstead Parish Church hosted their first shelter season last year, bringing the total number of churches involved in the scheme to 13. Steering Group: A Steering Group made up of previous shelter guests has been formed to provide the C4WS Trustees with new insights and recommendations for areas of focus for the charity. Sunday Club: To meet the needs of guests on a day when most services are closed, a Sunday Club was launched at the start of this season. Running from 10am to 2pm, offerings include laundry facilities, art workshops, cooking sessions, movie screenings and a quiet room. New Staff: A second project worker has been added to the C4WS team in order to meet the staffing demands of the various new services that are on offer. Copyright © 2018 American International Church London, All rights reserved.